I've been amazed at the headlines about so many Olympic divers scoring zeros during competition. Is this common in Olympic diving? If so, is there an easy explanation? It just seems odd to me that divers could misjudge their dives so badly as to do so many bellyflops. If gymnasts did this, they would be leaving on stretchers a LOT! It is never common in a diving competition which is usually held in indoor swimming pools. The biggest cause of those belly flops and misjudgement of dives was a very strong wind. 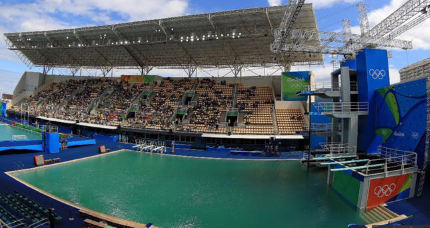 The diving pool has been a big embarrassment for Rio organizers and they should be blamed for not having anticipated the effect of strong gush of wind on divers when it could be powerful enough to knock down aerial camera and cables injuring seven people. "It was the wind that really affected the start of my dive. We didn't train in these kinds of very windy conditions before at all,"
I am confident that future Olympic organizers will take the wind factor more seriously than Rio organizers did. It's another shame for Rio. Not the answer you're looking for? Browse other questions tagged olympics diving or ask your own question.